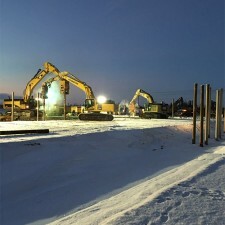 American Piledriving Equipment (APE) is the world's leader in research and development, production and sales of foundation construction equipment. APE produces the world's largest pile drivers, and has offices in every corner of the United States, Asia, and has distribution worldwide. Thank you for visiting our website and we hope you will find the information and resources valuable. This section provides a preview of the most recent article from each APE branch. Click on the article to view the full text and photos for the article along with other articles from that selected branch. 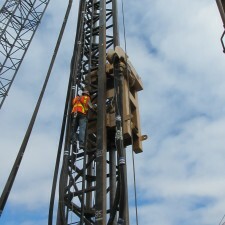 Dewitt Construction had few big holes to drill in Hillsboro OR. Holes were 30” diameter and 85’ deep. The 100K drill was just coming out of production and this was a perfect place to put this newly designed drill. This project in Hillsboro was in one of the INTEL facilities, and was very difficult for myself and Scotto Gray, one of the designers for this Drill, to get on site for an equipment evaluation. Speaking from experience, it is not every day you walk onto a job site with a “prototype” piece of foundation equipment and the super intendant says, with a look a complete satisfaction in his eye, “don’t change a thing, this has got to be the best drill I have ever used”. So we watched the drill work for a couple of hours, everything going just like clockwork. And as the drill approached the 40’ mark Jeff, the Super on site described the material from 45’ to 85’ as a very stiff clay, resembling “bay mud” as Jeff described it. This material was so sticky and heavy that it would not carry itself up the flight, they would take 10’ bites and bring the flight out of the hole and have to remove it with a mini-excavator. The drill has been running in APE 37 inch U leads which the customer liked so well they are buying this set of leads. 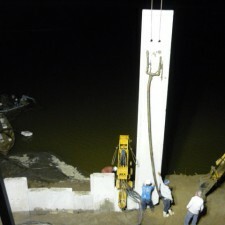 There were 60 holes drilled and the 5 inch grouting system was used to pump grout at pressures averaging 1000-1500 psi. 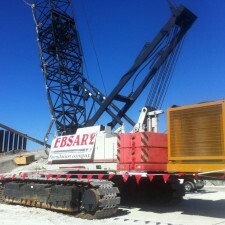 Ebsary Foundation Company of Miami, FL installed the first test pile for the US Army Corps of Engineers Herbert Hoover Dike Culvert 1 & 1A Rehabilitation project along Lake Okeechobee in Moore Haven, FL this past week. Ebsary purchased the drill late last year with a new 765 HP APE Power unit and a new APE Model 300 Vibratory Driver / Extractor. The demonstration, reaction and test piles were all 24? 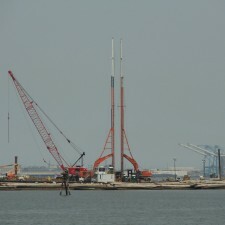 diameter and ranged in length from 88 - 9 3 ft. 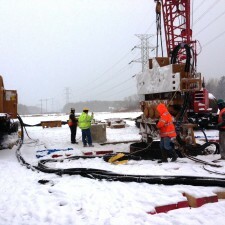 The piles took approximately 14 cubic yards of high strength grout with average drilling and pump time of 25-35 minutes. This was the first time Ebsary used their new APE / J&M 110K Drill and it ran perfectly with no problems of any kind. ?APE/J&M continues to provide Ebsary with durable, reliable drills and vibratory hammers. Their equipment capabilities and dependable service have allowed Ebsary to confidently pursue larger foundation and marine w ork? says President Scott Alfele. We at APE / J&M are proud to be the Main Supplier of Foundation Equipment for Ebsary Foundation Company and look forward to many more years of helping them stay at the top of the Foundation Industry in Florida with 24 / 7 Service and the best products available. APE / J&M has a new 110,000 ft. lb. drill in stock for immediate delivery, for information concerning the Purchase or Rental of the new APE / J&M 110,000 ft. lb. Drill please call Jim Casavant @ 1-863-660-8716 or email Jim at jimc@apevibro.com. 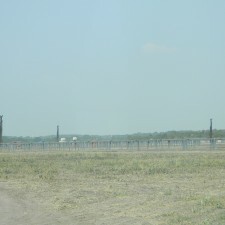 AUI is building the largest solar panel farm in Texas using three APE DHJ85 pilerigs. The piles are 6"x9lbs per ft. h- beams that are 20' long. 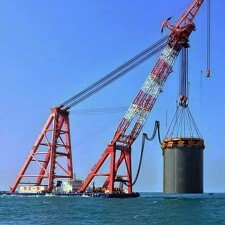 The job consists of 26,400 h-piles and AUI is averging between 125 and 150 piles per day per rig. This solar farm will generate 30mw of power which is enough to power 12k to 18k homes once it is complete. Matt Even who is the Assistant Civil Project Manager for AUI on this project says "The equipment provided by American Piledriving Equipment out of Conroe Texas has worked great on this job! The combination of service and service response time has been critical to the excellent performance and production of the DHJ 85's." It is with pleasure that we here at APE introduce Chris Corp to our friends in California, Utah, Arizona, Nevada and Hawaii. 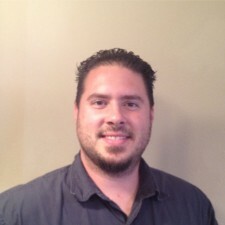 Chris is a 10 year veteran of the piledriving industry with experience from the ground up. Chris served as a service technician in the corporate office for a few years before moving to our Missouri facility to take on the role of service manager. His years as service manager in Missouri prepared him for his next role with APE as our California Service Manager where his skills and abilities took him to the next level of greatness. 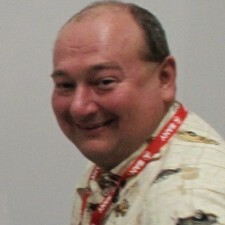 After the passing of our friend and Vice President, Dave Yingling, a void needed to be filled and after serving APE California for 20 years Steve Cress stepped up and assumed responsibilities as the new Vice President of APE and moved to Washington to apply his 30 years of piledriving knowledge on a new level of excellence. Chris Corp, in turn, stepped up his role from California Service Manager to California Western Division Branch Manager and assumed responsibilities to keep our California branch running smooth and strong. Chris has brought a fresh new drive to the California branch and hit the ground running to meet the needs of our customers. With Chris at the helm of the California branch and the backing of APE corporate, expect to see great things in 2014 out of our Western Division. Please help me welcome Chris Corp! Go get em Tiger! 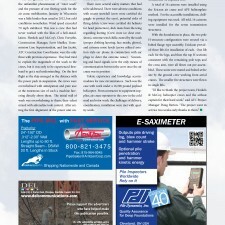 Piling Industry Canada published the story below on the Henkels and McCoy job on the Wisconsin River. The projects APE has gone airborne with Erickson Air-Crane in the past have always been challenging for the crews since jobs like this are so infrequent. American Transmission Co and Henkels & McCoy did a great job with the challenges the project had to offer. We are happy that our J&M 28-35 and Helitemplate were able to help these guys get the job done. APE Austria has begun a massive shipment of new APE Model 200 vibratory pile driver/extractors to the UAE. This is in response to recent electronic and overheating of our competition's so-called new units in hot weather conditions. APE machines are will known for their simplicity and ability to handle both the hot Saudi Arabian sun and the cold of Alaska. The secret is our unique kidney loop cooling circuit which can be reversed in cold weather. 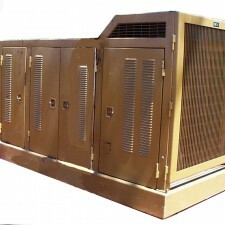 APE units come with massive heat exchangers and a special kidney loop oil cooling system that keeps the machine running even in 125 degree temperatures. APE developed a simple electrical system to mate with the advanced Tier III CAT engines. We avoided adding fancy touch screen panels that are subject to code failures that shut the unit down and require re-programming to get started again. APE machines are simple yet advanced. Our hydraulic gauges are old school simple yet our CAT Electronics are fuel efficient. Our power units feature a built-in spare hydraulic tank, CAT Tier III engine, Super Heavy Duty radiator and oil cooler, kidney loop oil system, all stainless steel control panels, tachometer in the remote pendant (found only on APE machines) tool box with spare jaws and hoses and tools to do all the maintenance work and a 5 year warranty. The 170VM has driven 1000 sheets since it first started working. The new APE concrete clamp kicks bud! APE China response time to send new set of jaws was only 3 days! Impressive!!! Thank you David White and APE China staff for making it happen. 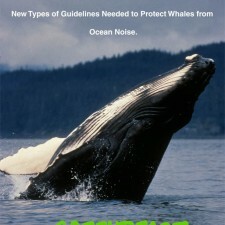 For more details on the Cabo Riviera project see my first article from back in November of 2011 http://www.apevibro.com/wordpress/2011/11/01/ape-170vm-has-been-spotted-in-los-cabos/. APE is again called to duty in Northern Manitoba. A couple of years ago, APE did a 5000 pile job for a 3,000 man camp at Keeyask, where we showcased some of our pre-drilling capabilities. Now it is the coverter station at Keewatinohk, where we are pre-drilling the seasonal frost, discontinues permafrost, and some Canadian shield with our latest achievement in drilling technology, the "Polar Penetrator." This patented drag bit allows high pressure air to eject cuttings out of the hole as soon as they are loose, typically at least twice if not three times faster than conventional tools. This drilling technique, along with the "down hole" accessories , allows APE's HD program to stay in the lead on today's helical pile market.